According to many experienced marketers, SEO (search engine optimization) is one of the best ways to increase market awareness of your business in our highly technical modern world. It is cited as having a higher ROI (return on investment) to most other marketing mediums. 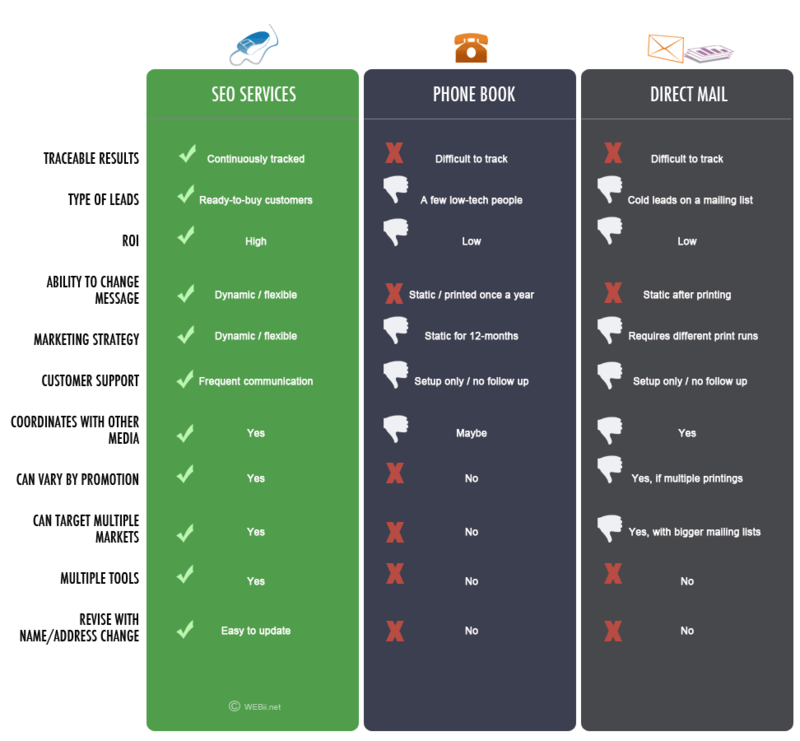 Here is an quick comparison of SEO with some traditional methods that are still used in marketing today. While some things may seem obvious (use of the phone book is diminishing), this an interesting way to look at the differences. There is a very significant number of positive aspects to SEO services Austin businesses can take advantage of, compared with the other traditional media they might be using. Traceable Results: We help analyze all traffic statistics for your website and provide ongoing updates and reports about your website’s marketing progress. Types of Leads: When people are searching the Web for your product, they are seeking you out! These are known as incoming or inbound leads and can result in ideal customers. People calling from the phone book are also inbound leads, but they are a rapidly decreasing number of people who are low-tech and unwilling to use modern communication tools; these might not be your ideal customers even when they do call. Direct mail relies on a mailing list of people you may or may not have a relationship, and you have no idea if they actually want your product. ROI: Many traditional marketing methods are known to have a low rate of return, sometimes lower than 1%. Search engine optimization can have high quality results and be tweaked dynamically to improve results over time. Ability to Change Message: If you want to change the content on your postcard after you printed it, you are stuck with only one choice: order and print a new set. This kind of effort can be costly and take time. With online marketing, your website is the central place where your message is displayed to customers. The website can be easily edited anytime, giving you more control to optimize your message to customers. Marketing Strategy: Online marketing is truly amazing – it provides a very dynamic and fluid media that you and your SEO team can use to maximize results. WEBii provides research and strategy with every SEO project. With a phone book or other printed publication, you are locked in to a static ad design for a long period of time (maybe a whole year). You can work with other direct media to improve your strategy, but you will require additional ad designs, printing and mailing costs. Customer Service / Advertiser Support: WEBii communicates with you about every aspect of your SEO marketing plan, including extensive initial research and ongoing updates, weekly and monthly reports. Our local staff shares information, documents, content, statistics and more to help you succeed. Most traditional media companies provide customer service during the sale and setup of your service, but after it is published, they no longer provide assistance. Coordinates with Other Media: Since web pages are dynamic and quickly updated, you can design new landing pages, new content and change messages to match with other marketing efforts you are doing offline or in social media. A phone book probably doesn’t coordinate with other media, since it is usually just a simple static ad and cannot be changed until the next issue. Direct mail pieces can be coordinated with other media, with some more strategy, design and printing. Can Vary By Promotion: Your SEO Services Austin campaign can be tailored with specialized keywords, content or landing pages to create specific visitor experiences and coordinate with various service types and promotions. The Internet is a wonderful flexible tool! Can Target Multiple Markets: Each SEO strategy includes a plan to target specific areas that make sense for your business. With SEO, you are not always limited to just one small region; your campaign can expand into other cities to find more customers. We can use the power of local listings, maps, and local search intelligence to get your better localized results in those regions. Multiple Tools: With SEO techniques today, we use multiple tools to promote a website, including several search engines such as Google, Bing, Yahoo. We also work with other websites, blogs, press, online publications, forums, social media and more. Revise with Name/Address Change: Sometimes businesses go through a brand change or move to a new location. Traditional media offers no flexibility to update that information! You are stuck with an old print ad with the wrong address! But with SEO, our dynamic online marketing can be modified as your business changes. Contact us today to ask for an SEO proposal.